A Ukrainian toy shop has revealed the forthcoming The Last Jedi set 75230 Porg on its website. No further details are provided, although the set is said to retail for 70€ in Germany when released in October. You can view images of the front and back of the box after the break. Your scientists were so preoccupied with wether or not they could that they didn't stop to think if they should! To echo Darth Vader at the end of Episode III: NOOOOOOOOOOOOOOOOOOOO! TLG, take your meds. Or at least change your dealer. Might have looked better in Duplo. Silly and ugly ucs ever. If a team of explorers found this thing in the depths of a pyramid's labyrinth, they would be scared to death of touching it, let alone taking home. The thing looks cursed, poisonous even..... bit like TLJ and nu-Star Wars come to think of it. EDIT; looking at this thing again, surely there would have been some parts budget left to include a couple more minifig-scale exclusive Porgs? This is a UCS set with none of the appeal of the others (even Echo base had some exclusivity). To echo earlier comments, why?!?!?! Who did TLG think would buy this? I like it but think it looks a lot better when the mouth is open. It does capture the mournful look. It's a bit limited in play features but I suppose it is a UCS-style set. They could have integrated the pooing feature from the Parrot in set 31031 (Rainforest Animals) but using part 64648 (Fish w. Knob). A brick-built recreation of part 33057 (Turkey, Drumstick) but at the same scale as the Porg would have been a nice side build. Hopefully they don't have an UCS Ewok in the pipeline, now that would be truly awful! It's like drunken LEGO dare. Also is the back pearl colored? Attack of the killer porgs?! I quite like it. I think the designer did a very good job capturing its shape and details. And I'm pretty sure this set is not UCS, since 75187 BB-8 wasn't either. A stand with details doesn't necessarily mean it's UCS. This year has been the worst year for Lego sets, and this just sums it up. I have money in a ‘Lego fund’ waiting... doesn’t look like TLG will be getting any of it for a while. I don't know what to think about this one. 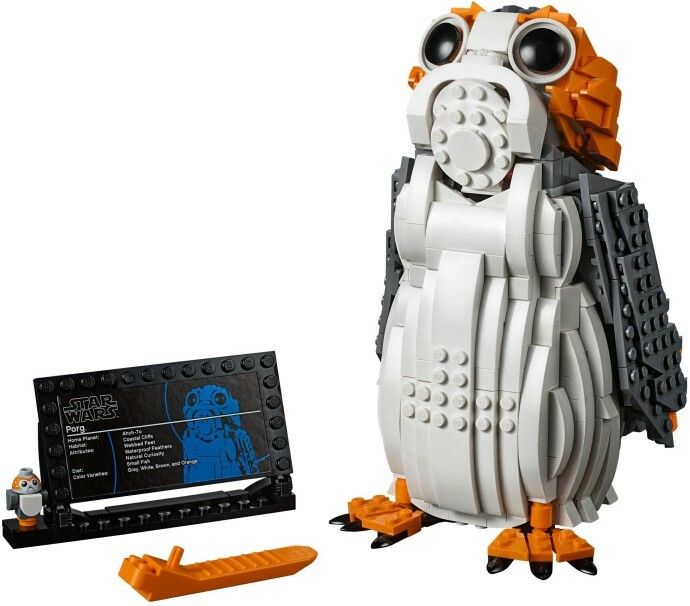 I can't find it good, but I don't think it is completely bad as a Lego representation of a Porg. I guess my entire lack of objectivity about Lego SW sets gives it a chance. And also because I'm also (with my daughter) among those who like these creatures in the movie. But there is very little chance that I get it, unless at a very very good discount. Very odd choices from Lego and designers with this one. An opportunity for releasing something actually interesting is wasted. Ah, subjectivity; ain't it great! When Voltron was announced as an Ideas winner, I shook my head & asked, "By my various gods, why waste an Ideas release on that thing...?" but people have gone nuts for it. And lest we forget, LEGO wasted an entire THEME on Brickheadz, which some have lapped up. All this just goes to show that you can't please all the people all the time, but thankfully there are enough LEGO sets out there for everyone to find something they love. Let's be grateful for that. 6/10 lego I've seen better from lego star wars.. Funny, I love it, and If I collected models for display I would buy it. When did Lego Juniors get a UCS line? This is the answer to a question no one asked. I think overall it looks okay. However I imagine it will be like $100, they're not exactly iconic characters, it barely has any functionality, and it's not really something that would fit in among other Star Wars display items. Plus it's a bit expensive and more detailed than most people would want in a set for kids, so it's not exactly a set aimed at young kids that love porgs. I can't see many kids above 12 having any interest in it whatsoever. I mean, why not take the chance to release a model of C3P-0 or R2D2 like this? People would eat it right up. Even L3-37 would have been fine . . . or hell, the pit droid from The Phantom Menace. Plus Lego will release something like this, but they're not interested in releasing similar models that look like real animals? I bet people would have more interest in a similar model based on a bird, a dog, or some other type of real animal. To me this screams being something Disney was pushing for, and not Lego. It's so far outside of what Lego normally releases and even in the Star Wars universe there's tons of other somewhat similar models they could make that would have much more appeal. As I said, I think it looks okay but it really seems like a weird choice for a model and I struggle to see what audience they're aiming for here. Honestly looks kinda cute, screw you guys! "I have felt a great disturbance in the force... As if a million voices cried out in terror..."
I wish it had a 2X4 sound brick inside so It could go "yree-yree" when you open the mouth. I am 100% sure it would make the set better. I very much liked the porgs in the movie and I own a really funny shirt with three porgs on it. If this were a MOC I'd be super impressed and as it is I think they have captured the source brilliantly and the designer should be proud. That said, I don't want a UCS Porg and I don't know any adults that would. So it's a great kids' toy but then there's the price tag... so what's the point? My family loves the large models and have been collecting them for years. This will display nicely with our other large SW models of Yoda, Darth Maul, BB8, and R2D2. I agree that a more iconic character would have made more sense for a large model like this, but I still think it looks brilliant given the subject material. Absolutely a day one purchase for us. This is just my opinion but as I opened this article the images took a while to load and when they did I was horrified. I was expecting something adorable but instead I got this. Some things should never be rendered in Lego. This is one of them. The back looks even worse than the front. The really bad news is, since it is so hideous, it will be in stock for a long time. On a related note, Chewy should have ate that porg! Eh, doesn't look too bad, but I personally have zero interest in buying it. This will sell like hot cakes. Its purpose will be to drag ordinary Star Wars fans in to Lego. I'm hoping that, when it inevitably fails to sell, there are some massive discounts on this. Unlikely, I know, but there are a lot of parts I'd like in this. The set looks good and they did a good job making it resemble a porg. If you don't like it, don't buy it, but I don't get why everyone immediately hates on anything to do with porgs. Honestly, this looks like it's meant to attract people caught up in porgmania to the rest of the range. Easy pass for me, but it looks like it will be popular. A porg big enough to eat Chewbacca! I have no hatred for Porgs, but we only get 2 UCS Star Wars sets a year, so yeah, I'm disappointed. To thin we could have gotten a UCS Cloud City instead of this, and a group of Lego employees sat down at a table and decided on this instead... Why? Porg is cute for sure and the set is fairly decent to be honest but doesn't change the fact that it's just another pointless and uninteresting character in the new triology. @Psychic Tempest Zero: I'm almost positive this isn't the second UCS set. I don't even think it's UCS, technically, but just a retail set similar to BB-8. Cloud City is still very likely to happen! Where are people getting UCS from? This is clearly a similar item like BB-8. Same price range even. I think it looks great and I’m not a huge star wars fan. But I likely won’t buy it until in a good sale like I did with BB. If everyone hates this as much as this forum says, then we should see some good clearance prices and that is still a win! I checked this news just to see the comments. I'm glad most of people thought it was a very unecessary set. Disney is trying to turn Porg into some iconic cute mascot. It WON'T work. Is this a joke? And is that actually a UCS set? What are the people at LEGO smoking? This doesn't appeal to me, but I can see how others might like to display it. There are many other animals I'd like to see LEGO do at this scale. Just a regular cat or dog would be cool. There are plenty of animals from licensed themes they could also make, Hedwig or a Niffler would be great. Am I the only one who got the impression that after Chewbacca ate the fire roasted Porg he decided to capture them so he could breed them for food? I don't believe such a set exists. Hi, I'm a Star Wars Fan[TM] and a LEGO Fan[TM]. I will only acknowledge the pure movies that premiered between 1977 and 1983, and will accept nothing less that original licensed LEGO Star Wars sets with yellow heads. Changing times and creative thinking is not for me to dabble in, and I will do everything in my power to put a stop to it, including boycotting new movies, harassing actors and production staff, and spurning children's enjoyment of new toys. For the most part I love this set, with one exception: the mouth. That gapping maw is in no way cute or friendly and does not at all capture the sweet innocence of our beloved space puffins. Really ruins the model for me, but I probably wouldn't get it anyway. Does this mean we’re getting 3 UCS sets this year?? With this, the Y-Wing and the all-but-confirmed Cloud City? I can't wait for the ucs jar jar bust personally. Barf! And stop talking about USC Cloud City until it's an actual thing. What is this? All that negative force here. Come on it is just a TOY! At least they try something different, instead of the endless remakes. How many millennium falcon's or x-wing's do you want? Geez that is some ugly box art for that parts pack. Chewie should have just eaten all of them up while he was on that god forsaken island. That's a big, "No Thanks." Lord Almighty, a Star Wars jumping shark. This seems like a miscalculation. Don't get me wrong - the design is great, and the Porgs were hilarious in the film. But I can't imagine who would be looking to buy this thing. With it being done likely at the scale of the BB-8 and R2D2 sets (which were extremely popular), maybe I'm wrong and it will sell out quickly. But I doubt it. If you don't like it just don't buy it. You're not forced to buy it it is a hobby, if you like it buy it, if not don't. But don't try to force you're meaning to others. Some are allready commenting as of there life is depending on it, so stop the negativity and i'm not the only one thinking that way, just stop and keep the ugly comment to you're self. How cute! And I'm impressed by both the part selection (so many of those newish corner-cut baby bows) and the functionality (a feature of last year's BB-8 that I was worried this set would be lacking). They could have picked anything or anyone... Literally, ‘any’. But they chose a PORG? This is pretty surreal - it’s like an April Fools joke turned into a nightmare. I don’t deny it’s well designed, but why this over anything else? He looks way too tall. I don’t think they should’ve included the ability to move his mouth, it ruined the whole build in my opinion. Despite what others say I like it but I couldn’t justify getting it for $100 hope the price in the U.S. is good. Trying to decide if this nudges Assault on Hoth out of place as worst set of recent SW history. Would you like some cheese with that whine, sirs? I think porgs are cute in the same way I think spiders are cute. Creepy mouth, creepy eyes and creepy legs, but otherwise they're cute. I like the porgs in Star Wars: The Last Jedi and actually think this set looks pretty good on the whole. The open mouth looks slightly awkward and the studs on the underside of its jaw are not ideal but the feathered texture is fantastic, particularly on the back. With regard to the proportions of the model, I think the fact that the porg is looking upwards is exaggerating its height. Otherwise, the relative width of the body compares favourably with the movie. It's clear to me that a lot of people here comment without bothering to read through any one else's comments first. Seriously, how many times do need to be told that it's not a UCS set? Man, LEGO Star Wars fans are a bunch of whiny manchildren, aren’t they? I guess I shouldn’t be surprised. Anyhow, this set is adorable, just like the Porgs in the movie, and I’ll bet it’ll be popular with kids and families just like other porg-related merchandise has been. Y’all need to lighten up and appreciate that there’s room for cute fluffy things in your space adventure stories. ok in the movie the Porgs were kinda cute, and I don't mind the y made one but is it just me or does the open mouth version on the box look like a demented VAMPIRE PORG!!!! It just dosent look sweet at that size. Look out its the attack of the killer porg!!!!!! Well, that's hideous, on the verge of nightmarish. I think it's difficult to do justice to something that's meant to be soft and feathery ... when the building material is hard, plastic pieces. I don't much care for it (that picture on the front of the box with the animal's open mouth? Terrifying), but I'm happy to just not buy it. Wow... I thought this was a joke. The set won't appeal to any enthusiasts, and it isn't even exclusive (At least the price tag isn't...), plus it is a UCS set, so will probably be hard to find for those who do want it. $10 says the guy who walked into a room and said “ya know what, let’s make a movie about a tornado full of sharks” is behind this monstrosity. Surely this is a hoax???? Man, Lego fans are a hard group to please! The vitriol in these comments astound me. If you don’t like it, don’t buy it. It’s just a damn toy. I, personally, like it a lot and for what it’s worth will be buying it. @canadianboy11: for me, it's the opposite ! I don't like porgs, but I like the Lego rendition. Well, they say birds are descendents of the dinosaurs. Now imagine if birds instead were descendents of Garfield and a Minion, then we'd end up with this - a creature who exists solely to be cute and marketable. > I wish it had a 2X4 sound brick inside so It could go "yree-yree" when you open the mouth. Maybe you could install the one from the 4958 PF dino, it'd at least sound kinda close. If I'd cared more for the new SW movies I would've loved to have both this and the 75187 almost-UCS BB-8, especially as the colors matches so nicely. Also, are those dark grey 1x2-plates-with-3-irregular-claws used to texture the back a new part? Edit: I was thinking if it would be an idea to have a voting when a new set shows up (possibly in the press release article) what people thinks about it? It could be as simple as "Will buy" and "Won't buy" or ideally more nuanced options like "I'll buy this", "Maybe on sale", "It's a nice set but I won't buy it", "Meh" and "This set is stupid and shouldn't exist". Not for me, but looks pretty good for what it is. I don't understand the few people complaining about the negativity, and especially the insults to other members. Are those whose opinions differ from yours not allowed to comment? Everyone should feel free to voice their opinion without the fear of backlash. I rather had seen a nice R2D2 UCS to put next to my BB-8. I definitely need 8 of them, to rereate the Hateful Eight shootout scene. @highfalutintodd and @Aanchir : And are only the positive comments valuable ? This is a free world, everybody has a right to his or her own view. We all had to bear your comments too. Everybody is equal, I'm sure you're all for that. On Topic: Didn't care for the Porgs (or the train wreck The Last Jedi for that matter) so it was never gonna make my wanted list. I find it poorly executed and very odd looking. I don't mind Lego doing these kinds of models, it is the Star Wars license anyway. I just feel this year is a little odd. Briljant stuff and really bad designs, all in one year. On the other hand, it does wonders for my wallet: removed several sets from my list. I don't understand why so many people are against the idea of this set. Porgs are actually immensely popular, and, at least for me, they were not an issue in The Last Jedi. Don't get me wrong, I think the film has issues, but the porgs were not one of them. I do think the set looks a bit odd though. That's a much better critique than just "Lego shouldn't have made this because porgs are dumb!!!" This isn't a USC set. USC sets use black boxes now. He looks like he is trying to see over a stack of angry Last Jedi reviews which were inexplicably printed off by someone's mom. Oh good, so I'm not the only one who thinks these creatures were foisted on the star wars universe solely for the purpose of merchandising. Did we learn nothing from Jar Jar? But yes, it's not a UCS set - just like BB-8 wasn't. It does come with a UCS style plaque though, which is a hilarious touch. +1 Lego. After some time getting used to it, it's not so bad. It's a little too tall in my opinion though. I'm still continuing my position that I really don't see why a background character (literally only created to cover up puffins in the background) gets a set so large, but I feel they did an excellent job on the set. Porgs, I feel would do well sold as stuffed animals, but not a huge Lego set that the average parent isn't exactly gonna buy. Why do I have a feeling that after this nobody will ever want to buy any porg merch ever again? My kids (7 and soon to be 4) both love porgs and will probably love this too. I'll get it for them when I can find it at a good discount. Ok, seriously?! Star Wars UCS Lego sets are geared towards collectors who are typically teens and adults who want a more detailed and involved build. This set is unnecessary and disappointing in my opinion. It's like Lego is trying capitalize on a "craze" that was very short-lived/practically non-existent. @ra226: Practically EVERYTHING in Star Wars exists solely for merchandising. Is that really a surprise at this point? It's pretty much always been that way. @TheMikeAwakens: It's fine to say "I don't like this set", but when people start insinuating that LEGO must be drunk/on drugs or other stupid comments like that it just makes them look ignorant and self-centered. Like, I didn't care at all for the Disney Princess Palace Pets sets, and am not afraid to say so, but I'm not going to pretend there was no point to them, that they were an abomination, or that only an impaired person could come up with them. 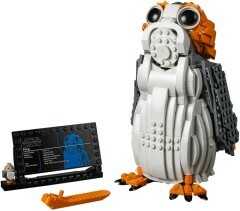 OMG...that has to be one of the ugliest Lego sets I've ever seen!